If you have enabled the Skills field in Program Options, then Skills Progress will be an additional area listed under the Students section of the HSTOnline menu. The Skills Progress list shows you all Skills which have been attached to one or more Assignments for that Student within the selected School Year. Each time you add a new Skill to one or more Assignments in the selected School Year, the Skill will appear on this list with a Status of 'In Progress'. From the Skills Progress list you can add notes about the work your Student is doing toward acquiring the Skill, mark the Skill as Complete and enter a Date Completed, view the Assignments to which the Skill is attached, remove the Skill from one or more selected Assignments, or replace the existing Skill with other Skills from your list for one or more selected Assignments. Use the Skills Progress Report to print out a list of Skills which are In Progress or Complete, along with any accompanying notes you have entered. The Skill Progress area is never available to Student Users as this area may contain Progress Notes which you are not yet ready to share with your Student. The first time you visit this area, you will see just the Student and School Year drop downs and Go button. Select a Student and a School Year and then click Go to get started. Once you have selected a Student, the list format for this feature will appear. Each time you return to this area, HSTOnline will show you the information for the last Student and School Year selected. Student drop down: Select a Student from the drop down list. School Year drop down: Select a School Year from the drop down list. Go button: After making your selections in the drop down list, click the Go button to view the Skills attached to Assignments for that Student and School Year. Edit: With one item selected, this action becomes available. Choose edit to change the status for and/or add notes to the selected item. View Assignments: With one item selected, this option becomes available. 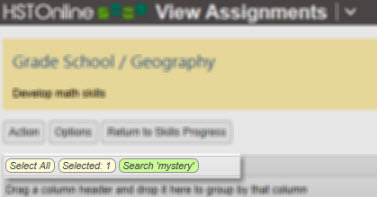 Use this option to review the Assignments which are attached to the Student in the selected school year. 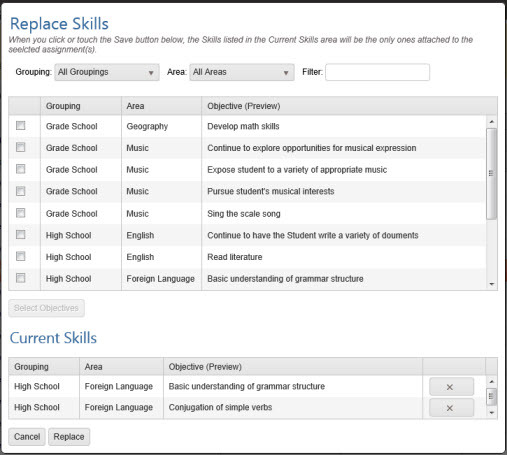 Choose Columns: Click or touch this option to select which fields will be displayed in the Skills Progress list. You must select at least one column. In the Skills Progress Filter you can view items by Status: Both, In Progress, or Complete. The default selection shows all 'In Progress' Skills. When anything other than Both is selected, the Filters Settings badge shows which types of items are being displayed. Search Box and Go button: Use the Search box to enter text and click the Go button to find Skills matching your entry. HSTOnline will do an exact search for whatever text you enter within the Grouping, Area/Discipline, Objective (Preview) and Notes (Preview) fields. Leave the search box blank and click Go or click or touch the Search text badge to return to the full list of Skills. You can edit any single entry in the Skills Progress grid to change the status between 'In Progress' and 'Complete', enter a Date Completed, and/or enter Notes about your Student's progress in that skill. On the HSTOnline menu, click or touch 'Skills Progress' under the Students section. On the Skills Progress page, double-click on the item you want to work with to open the Edit Skills Progress window. Alternatively, you can click once on the item you want to change and then click the Action button and choose Edit to open the Edit Skills Progress window. On a touch device, touch the item you wish to edit and then touch the Action button and touch Edit to open the Edit Skills Progress window. The Edit window shows the Grouping, Area/Discipline and Objective details for the selected Skill as well as the current Status, Date Completed (if complete), and Notes. Make whatever changes are necessary. Status: Choose between 'In Progress' and 'Completed'. Date Completed: This field is only visible when the Skill Status is set to 'Completed'. It is an optional field. You can mark a Skill as 'Completed' with or without entering a specific date. Notes: Use the Notes field to log any remarks about your Student's progress in this area, which can be included in the Skills Progress Report. The View Assignments feature will show you all of the Student's Assignments which are tied to a selected Skill. You can edit these Assignments to remove the Skill, replace the existing Skill with one or more new Skills, or delete the Assignments. Deleting Assignments from this are will remove them completely from the database. While you can also remove or replace Skills in the Agenda - List View using the Edit or Multi-Edit Assignment features, the advantage of the Skills Progress: View Assignments page is that all of the Assignments for the Student and School Year which are tied to the Skill in question are listed together for your convenience. As with most areas of HSTOnline you can choose which columns you wish to view for your Assignment details. The default visible columns for the 'View Assignments' list are: Date, Subject/Course, Activity, Resource, Skills (number of Skills attached to each Assignment in the list), and Complete status. You can select 'Choose Columns' under the Options button to display additional or different columns. HSTOnline will remember your settings. The columns that are available will depend on your settings in Program Options. Remove: Select one or more Assignments and choose this action to remove the Skill you are viewing from those Assignments. After removal, the selected Assignments will disappear from the list as they non longer meet the requirement of being attached to the Skill whose Assignments you are viewing. Replace: Select one or more Assignments and choose this action to replace all of the Skills attached to the selected Assignments. Delete: Select one or more Assignments and choose this action to permanently delete those Assignments from your database. Choose Columns: Click or touch this option to select which fields will be displayed in the View Assignments list. You must select at least one column. Return to Skills Progress: Click or touch this button to return to the Skills Progress page. Search Box and Go button: Use the Search box to enter text and click the Go button to find Assignments matching your entry. HSTOnline will do an exact search for whatever text you enter within the Activity, Resource, Topic, PLC, Custom, Directions (Preview) and Notes (Preview) fields. Leave the search box blank and click Go or click or touch the Search text badge to return to the full list of Skills. Select All: Indicates the number of Skills being displayed out of the total based on the current settings. On the Skills Progress page, select a Student and School Year and click or touch the Go button. Click or touch the Skill you want to work with and then click the Action button and choose View Assignments to open the View Assignment page. The top of the View Assignments window shows the details about the Skill you have selected: Grouping, Area and Objective. The list displays all of the Student's Assignments in the selected School Year which have are tied to that Skill. From the View Assignments page, you can select any one or more of the listed Assignments and remove the cited Skill from those items. This is a great way to clean up your records if want to remove a Skill completely from your list, or if you have erroneously attached a Skill to one or more Assignments. After completing this process, the selected Assignments will disappear from the list on this page as they will no longer meet the requirement of matching the Student, School Year and selected Skill. Rest assured, however, that those Assignments are still part of your database and can be viewed for the Student in the Agenda - List View or Agenda - Calendar View. Starting in the View Assignments page, select the Assignments for which you want to remove this Skill. Click the checkbox for each Assignment you want to work with. Click or touch the Action button and choose Remove to open the Remove Skill window. Cancel to abandon this process and return to the View Assignments list for the selected Skill. Remove to remove the selected Skill from the selected Assignments. Other Skills which may be attached to Assignment will be retained. Assignments which have been affected will disappear from the list as they no longer meet the parameters for inclusion, but will still exist and be viewable in the Agenda - List View and Agenda - Calendar View. From the View Assignments page, you can select any one or more of the listed Assignments and replace all existing skills for those Assignments with new selections. As part of the 'Replace' process, you can also choose to retain the existing Skills and add additional Skill designations. After completing this process, the selected Assignments will disappear from the list on this page if you have removed the Skill that is currently displayed at the top of the View Assignments page. If that Skill has been retained, they will remain on the list and the number in their Skills column will be adjusted to match the new total of Skills attached. All selected Assignments will have the same list of Skills at the end of the Replace process. Starting in the View Assignments page, select the Assignments you want to work with. Click or touch the Action button and choose Replace to open the Replace Skills window. At the bottom or the Replace Skills window, you will see the Skill or Skills attached to the first Assignment in your selection. This may not reflect all the Skills of all the selected Assignments. At the top of the Replace Skills window, you can use the controls to refine your selection. The settings start in a way to show all of your created Skills. Use the Grouping and Area drop downs to select specific options and/or type into the Filter box to refine the list. HSTOnline will use the text you enter into the Filter box to search the Grouping, Area, and Objective (Preview) fields for exact matches. Check each Skill that you want to add to the selected Assignment(s) and click or touch the Add Selected Objectives button. The items you have chosen will now appear in the Current Skills area along with any pre-existing Skills. You can use the 'Delete' button to the right of any Skill to remove it from the Current Skills list. Replace to replace all the Skills for all selected Assignments with those listed in the 'Current Skills' section. You can select any one or more Assignments in the View Assignments page to completely remove them from your database. Deleted items cannot be retrieved. Starting in the View Assignments page, select the Assignments you want to work delete.